March Chisolm was born at Cypress Plantation on the Combahee River in Colleton County, SC. He was enslaved by William C. Heyward of Cypress Plantation. He married Clarander Osburne on or about 17 September 1856. The Reverend Peter White officiated at the wedding. Molcey Chisolm, daughter of March and Clarander Chisolm, was born about 1860. Dianna Simmons was the midwife at her birth. March Chisolm died at Cypress Plantation 15 September 1869 or 10 October 1868. Molcey was about 8 years old when her father died. 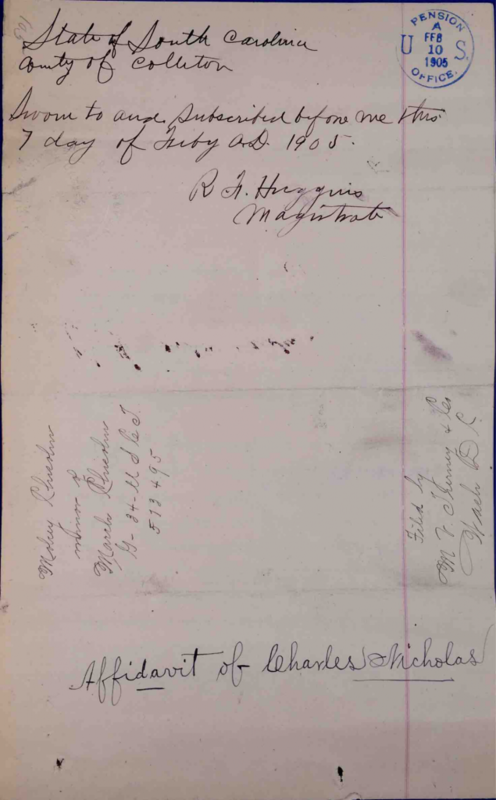 Clarander Osburne Chisolm [also rendered Clarenda and Clarinda in the pension file] died 27 July 1877. March Chisolm’s siblings were Painter Chisolm, Chester Chisolm, Hagar Roberson, Anna Murray and Jane Green, all of Bluffton, SC. March Chisolm served as a private in Company G, 34th Regiment, USCT (Infantry). 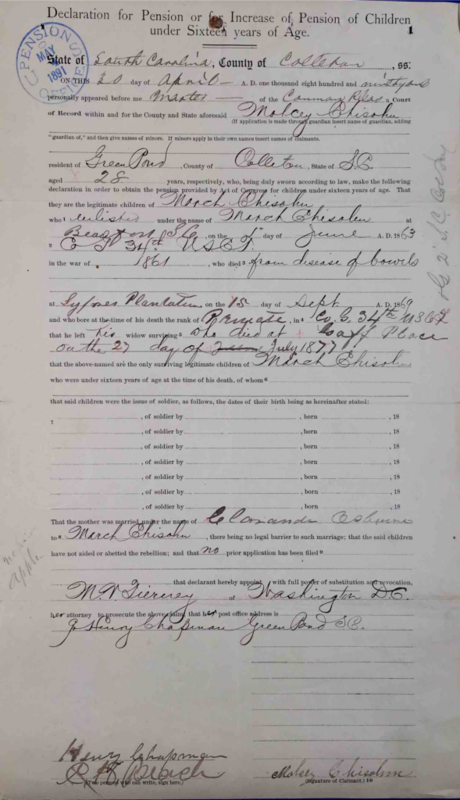 March Chisolm’s daughter Molcey Chisolm first filed for her father’s pension on 30 April 1891, claiming entitlement under the act of June 27, 1890. She was represented by attorneys M.V. Tierney and Company. 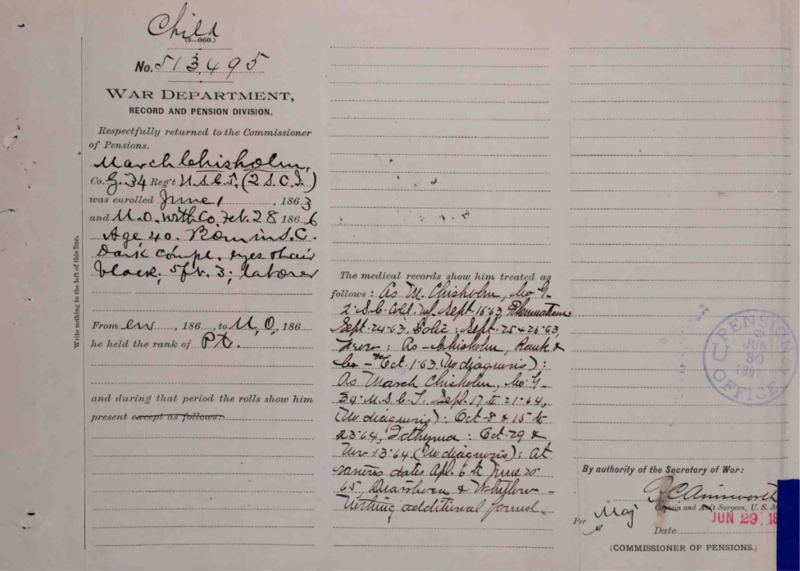 On 27 June 1891, the Bureau of Pensions requested that the War Department provide a personal description for March Chisolm. 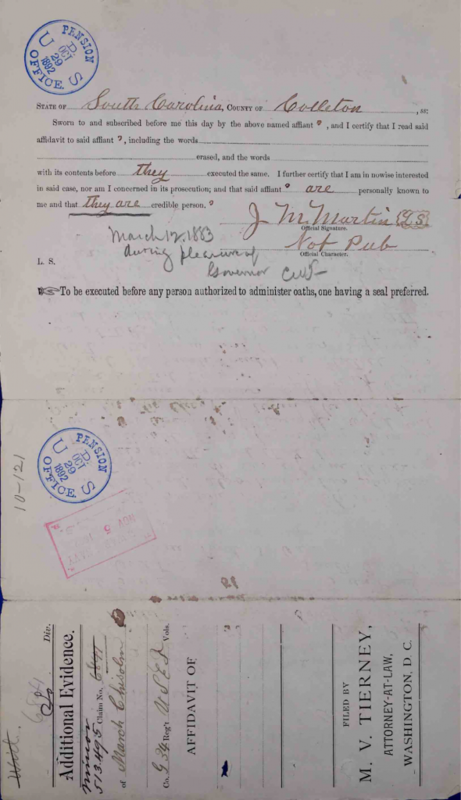 On 22 September, 1903, Molcey Chisolm’s pension application was denied on two grounds, that (1) the soldier’s death due to disease of the lungs was not shown to have been caused by his service in the military, and (2) Molcey Chisolm reached the age of 16 before the passage of the act of June 27, 1890. Molcey Chisolm’s reading of the act of June 27, 1890 gave her the impression that because she was about 8 years old at the time of her father’s death (regardless of her reaching the age of 16 before the passage of the act of 1890) she was entitled to claim a pension for her father’s service. 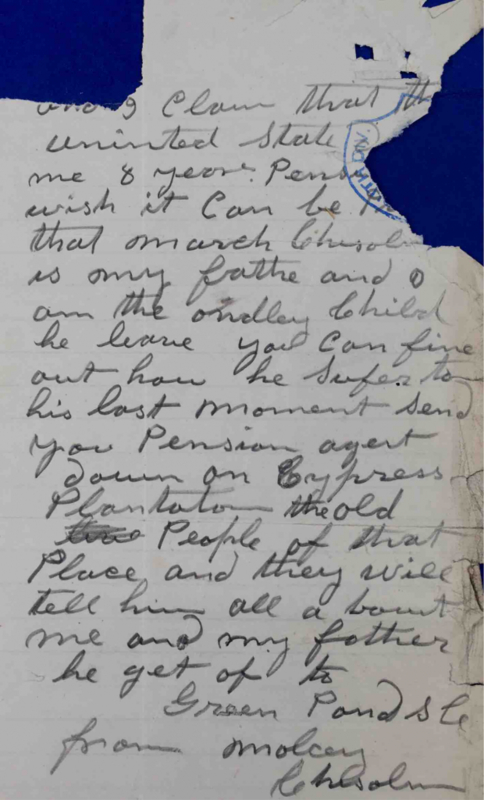 She wrote a series of letters to the Bureau of Pensions in the years after her claim was rejected, in which she repeated her assertion that she was due a pension because she was under the age of 16 at her father’s death. 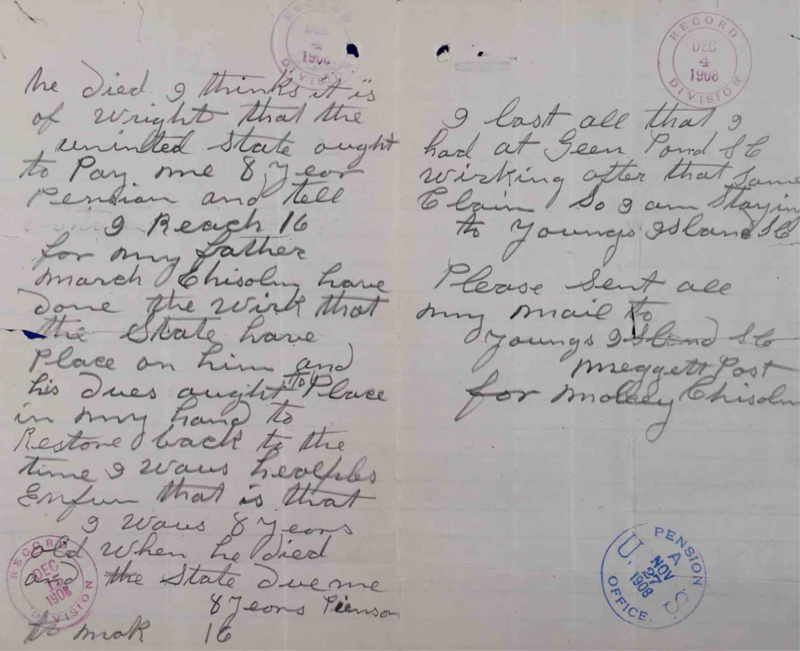 The Bureau repeatedly informed her in reply that her claim was rejected because (1) the soldier’s death due to disease of the lungs was not shown to have been caused by his service in the military, and (2) she had reached the age of 16 before the passage of the pension act of 1890. 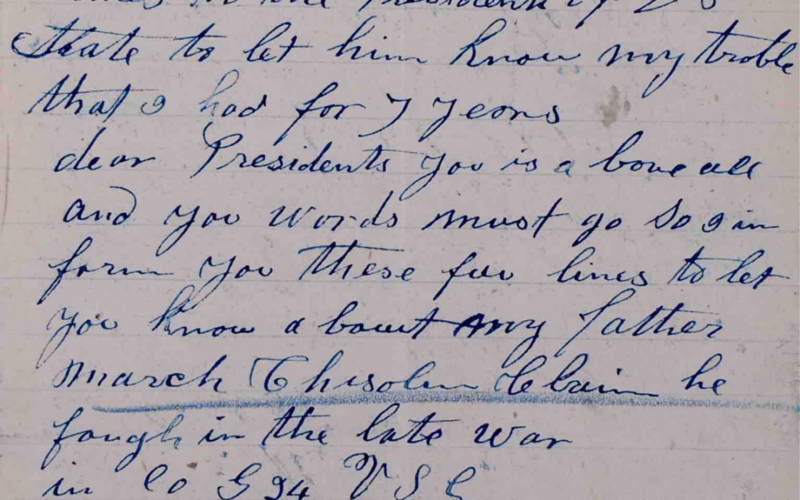 On two occasions, Molcey Chisolm addressed her letters to the president of the United States. Both letters were forwarded to the Bureau of Pensions. Summary of statement of Molcey Chisolm, 30 April 1891: She was a resident of Green Pond, Colleton County, SC. She was 28 years old. She stated she was the legitimate child of March Chisolm who enlisted under the name of March Chisolm at Beaufort, SC on 1 June 1863 in Company G, 34th Regiment USCT in the war of 1861. He died from a disease of the bowels at Cypress Plantation on 15 September 1869. He bore the rank of private. His widow died at the Gaff Place on 27 July 1877. Her name was Claranda Osburne. She was married to March Chisolm. Also present was Henry Chapman who resided at Green Pond, SC and C.H. Beash, also a resident of Green Pond. They stated they were present and saw Molcey Chisolm sign her name or make her mark to the foregoing statement. Summary of statements of Moses Simons and James Wineglass, 3 November 1891: They saw March Chisolm after his discharge and knew he suffered greatly from pain in the bottom of his stomach, pain in his side, and rheumatism that started when he was in the service. They knew he suffered until he died on or about 16 October 1867. Summary of statements of Edward Brown and Mrs. Elcey Heyward, 3 November 1891: They stated Clarender was married to March Chisolm on or about 17 September 1856 by the Rev. Peter White, minister of the Gospel. They were present at the ceremony. 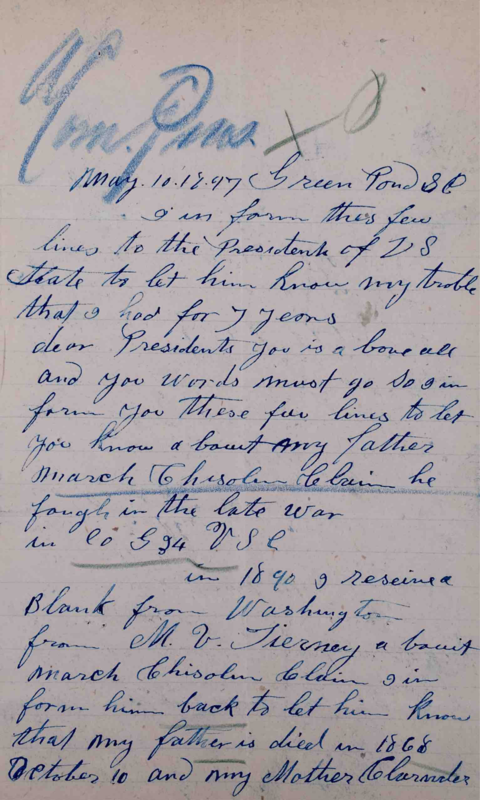 Summary of statements of Ansel Gilliard and Richard Proctor, 8 December 1891: They were well acquainted with March Chisolm and knew he served in Company G, 34th Regiment USCT. They were also well acquainted with Clarenda Chisolm, the lawful wife of March Chisolm. They knew March’s only marriage was to Clarenda and that their only offspring was Molsey Chisolm. They further stated that Clarenda Chisolm’s only marriage was to March Chisolm. 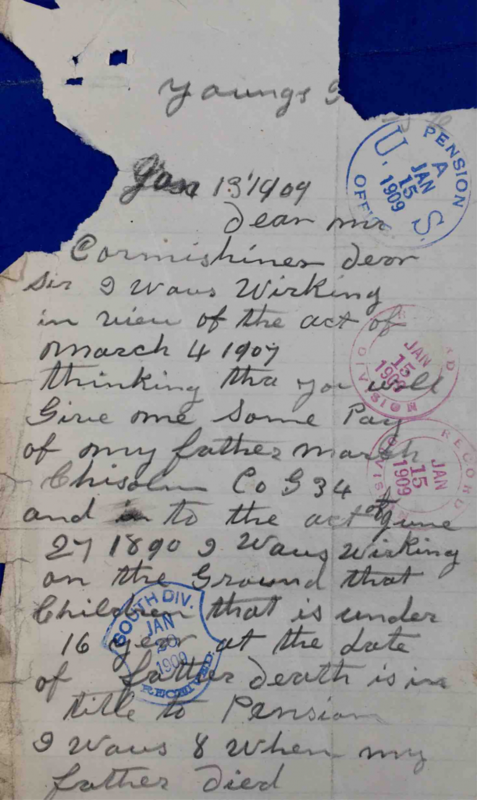 Summary of statement of James Wineglass, 20 June 1892: He stated he was in error regarding the date of March Chisolm’s death and that it was in October 1868. 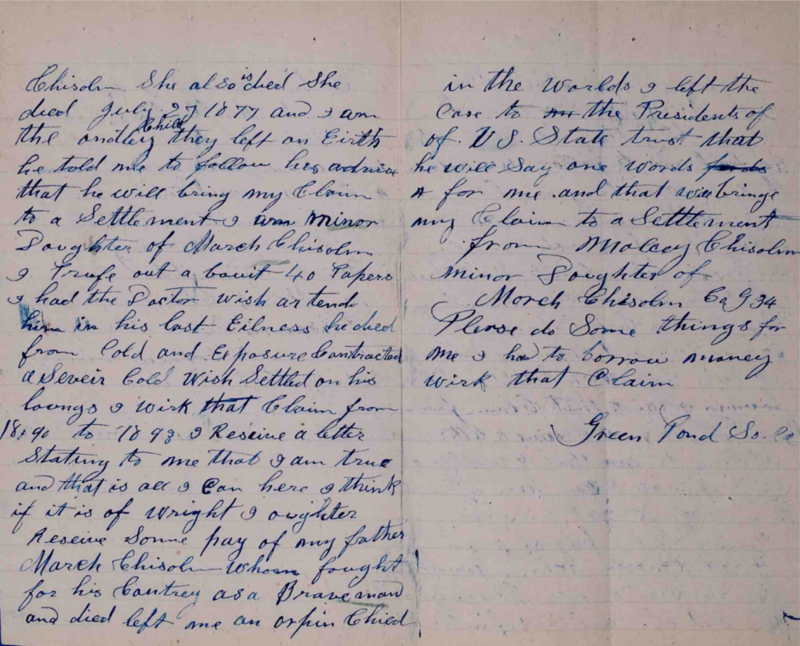 Summary of statement of Dolly Jenkins, 11 July 1892: She knew that before her death, Clarenda Chisolm was the wife and widow of March Chisolm and that Clarenda died on 23 July 1877. Dolly was present at the time of the death and assisted in closing her eyes and preparing her for burial. Summary of statements of Ansel Gilliard and Josiah Green, 21 October 1892: They knew March Chisolm from boyhood. They knew he was utterly unable to perform any manual labor after he came home from the war on account of a cough, cold, and pain in the chest. He continued to suffer from these conditions until he died. Summary of statement of H.E. Bissell, MD, 16 May 1892: He stated that March Chisolm was sick about nine months. He never knew him before his enlistment but attended to him in his last illness. He knew he died of inflammation or congestion of the lungs about October 1868. He kept no record of the sickness. He knew March left a child, a girl, by the name of Maulcy Chisolm. Summary of statements of Dianna Simmons and Sarah Barnwell, 1 September 1892: Dianna Simmons was the midwife who was present when Molcey Chisolm was born on 4 October 1860. Her mother’s name was Clarander Chisolm. Sarah Barnwell was present at the birth. Sarah, at the time of the statement, was 65 years old. Dianna was 61 years old. Summary of statement of Neptune Nicholas and Moses Simons, 11 October 1892: Neptune was 52 years old and a resident of Green Pond, SC. Moses was 60 years old and also a resident of Green Pond. They knew March Chisolm who served in Company G, 34th Regiment, USCT and who was discharged in the latter part of 1864. They knew March Chisolm contracted a severe cold from cold and exposure that settled in his lungs. They knew he coughed frequently and had severe pains in his chest and lungs, being unable to perform his duty at times because of pain because they served with him. At the time of their statements, they knew March Chisolm for 20 years. Summary of statement of Molcey Chisolm, 12 November 1892: She was 32 years of age and a resident of Green Pond, SC. She stated she could not obtain the testimony of a commissioned officer because none of them were around when she lived and their whereabouts were unknown to her. She also knew that no regimental surgeon was around and she did not know of their whereabouts. Summary of statement of Charles Nicholas, 30 January 1894: He was well acquainted with Clarinda Chisolm, wife of the deceased March Chisolm. He knew Clarinda died near Green Pond, SC on 23 July 1877. She was the lawful wife of March Chisolm and he knew this from an acquaintance extending back for 35 years. Summary of statement of W.W. Brown, Auditor, 2 August 1897: He reported March Chisolm’s siblings to be Painter Chisolm, Chester Chisolm, Hagar Roberson, Anna Murray, and Jane Green, all of Bluffton, SC. He stated Mollie [Molcy, Molcey] Chisolm was a child of the soldier. Summary of statements of Neptune Nicholas and Thomas Means, 30 December 1897: They knew March Chisolm because they lived near him for years. They knew March Chisolm never served in the military or naval service before 1 June 1863 nor after 28 February 1866. They knew March Chisolm before he enlisted. Summary of statement of Moses Simons, 13 April 1899: He knew March Chisolm while in the service in Company G, 34th USCT Volunteer Infantry. He always complained of pain in the chest and back. He knew March went to Dr. Hanson in the 34th Regiment. They mustered in at Beaufort, Pigeon Point and mustered out at Jacksonville, FL, being turned loose at Mt. Pleasant. He knew March died 10 October 1868 and that Molcey Chisolm was his daughter. He and March lived on Cypress Plantation before they went into the service. He stated March was not able to do heavy labor at all. Some days he holed up a little and could not move his feet because of pain. He got worse until he died. Moses closed March Chisolm’s eyes when he died. Summary of statements of Neptune Nicholas, 15 April 1899: He knew March Chisolm suffered from pain in the back, hip, chest, and that he coughed very much. He knew he was never able to do manual labor after being discharged. They were together on one plantation until March died. He knew Molcey Chisolm was his minor child and was seven years old when her father died. 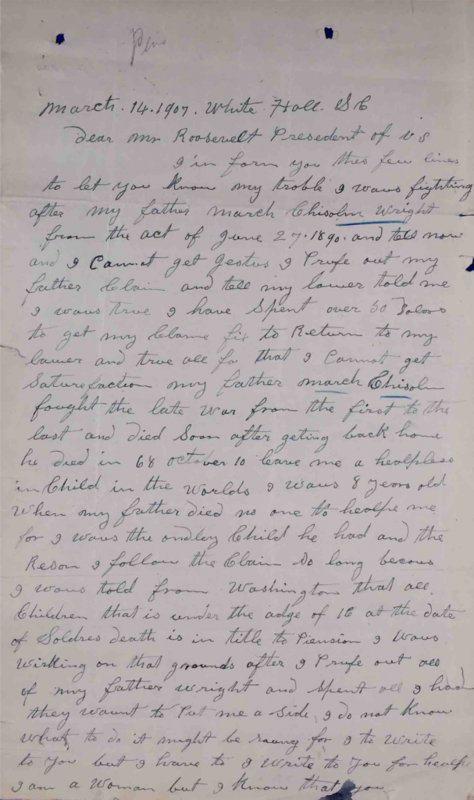 Summary of statements of Neptune Nicklas, 24 April 1899: He knew March Chisolm from the time he was a boy because they grew up on the same plantation. He also served in the same company and regiment as March Chisolm during the war. He stated March Chisolm was very faithful but he was an old man and contracted pain in his back, hip, and chest, and coughed very much. He always complained until he mustered out. He was never able to do manual labor until the time he died on 10 October 1868. They enlisted on 3 June 1863 at Pigeon Point, Beaufort, SC and mustered out at Jacksonville, FL. They were turned loose at Mt. Pleasant, Charleston, SC. They stated they knew Molcey Chisolm to be the child of March Chisolm. She was seven years old when her father died. 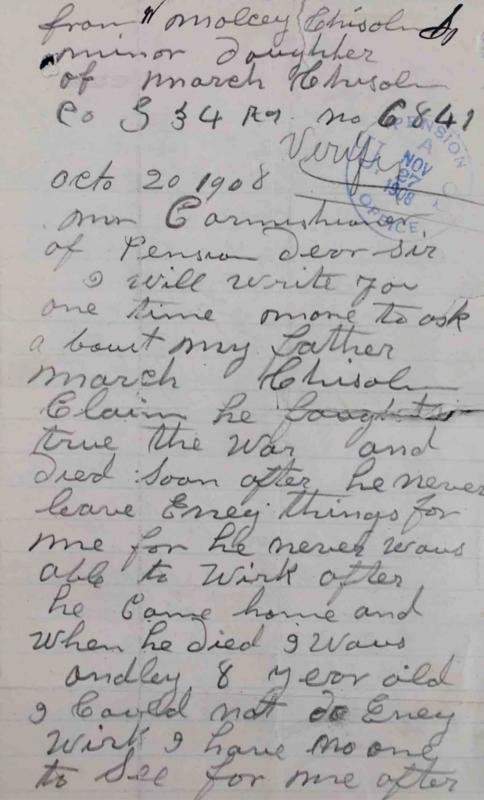 Summary of letter to the Commissioner of Pensions, 6 October 1903: The letter from his daughter, Molcey Chisolm, stated that March Chisolm served in Company G, 34th Regiment. He died on 10 October 1868. He was examined by Dr. H.C. Bissell who attended him in his last illness. March Chisolm died from cold, cough, and pain in the chest. He lived about three years after he mustered out of the army. Moses Simons and Neptune Nichols knew about March Chisolm’s last illness. 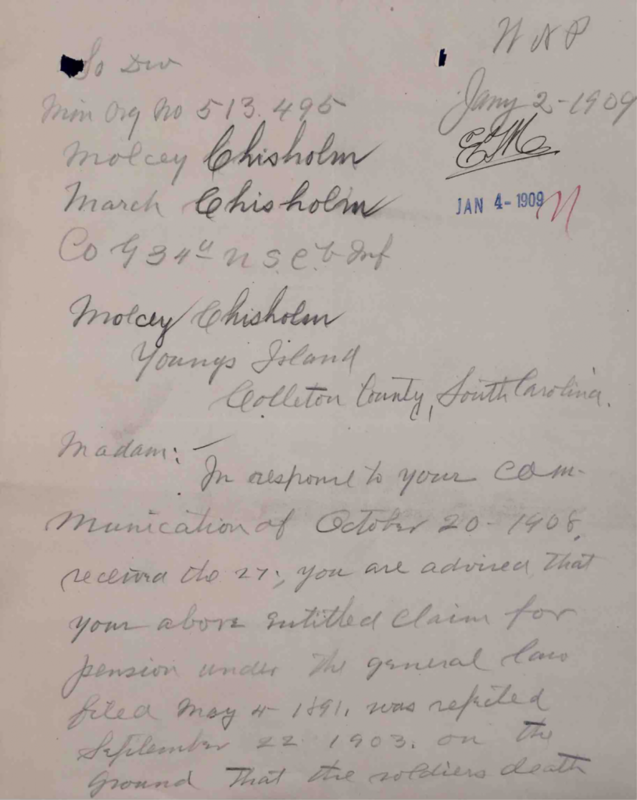 Summary of letter to the Commissioner of Pensions, 13 January 1904: The letter from Molcey Chisolm stated her father, March Chisolm, was a member of Company G, 34th Regiment. She was eight when her father died. She was the only child he left when he died. She stated the old people who lived at Cypress Plantation at the time of her letter would be able to tell the Commissioner about her father. 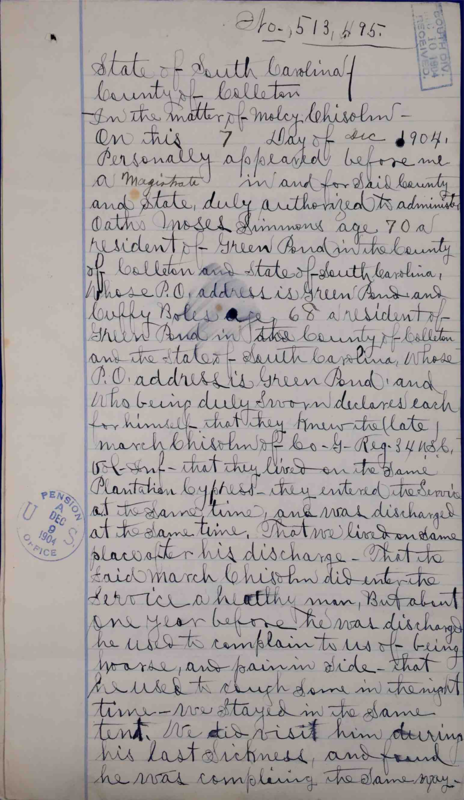 Summary of statement of Moses Simmons and Cuffey Boles, 7 December 1904: Moses was 70 years of age when he gave his statement, a resident of Green Pond, Colleton County, SC. Cuffey was 68 years old, also a resident of Green Pond. They knew March Chisolm having lived on Cypress Plantation together. They entered and were discharged from the service at the same time. After discharge, they lived on the same place. They knew March entered the service as a healthy man and, about one year before he was discharged, used to complain to them of being hoarse, with pain in his side. He also used to cough some during the night. They all stayed in the same tent. They visited him during his last sickness and found him complaining of the same things. Once when they visited, Dr. H.E. Bissell was there and said March was suffering from a cold contracted while in the U.S. Army. They knew March had a daughter, Molcy Chisolm, who was about eight years old when he died. Summary of statement of Samuel Campbell and L.M. Garvin, 7 December 1904: They stated they were present and saw Moses Simmons and Cuffy Boles sign, seal, and execute their depositions. Summary of statement of Mingo Vandross, 7 February 1905: He knew March Chisolm about 20 years before March entered the U.S. Army. They lived near each other until March’s death. They entered the service together in 1863 and were discharged at the same time in 1866. Mingo knew March was heathy when he enlisted. About one year later, he started complaining of having a cold and said his whole system was deranged. He was never a sound man again until his death. Mingo visited March after their discharge until March died. They belonged to Company G, 34th Regiment, USC Infantry. He also knew that Molcy Chisolm was the daughter of March Chisolm and was about eight years old when he died. 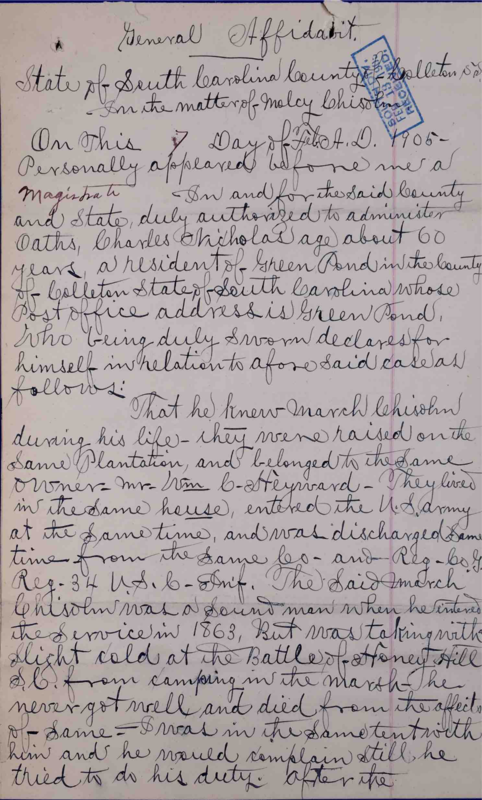 Summary of statement of Charles Nicholas, 7 February 1905: He was about 60 years old, a resident of Green Pond, Colleton County, SC. He knew March Chisolm during his life having been raised on the same plantation. They belonged to the same owner, Mr. Wm C. Heyward. They lived in the same house and entered the army at the same time. They were discharged together. March was a sound man when he entered the service in 1863 but was taken with a slight cold at the Battle of Honey Hill, SC because of camping in the marsh. He never got well after that and died from the effects of the cold. Charles shared a tent with March and knew March to complain but still tried to do his duty. After the Battle of Honey Hill, March got a cough and would cough at night. Dr. H.E. Bissell attended him and did until he died. Summary of statement of Dr. Simon C. Grant, 6 November 1905: He treated March Chisolm for the balance of 1868. He died on 10 October 1868. He knew March mustered out of the service in 1866. After getting home, he had pain in the side and chest, and he coughed night and day, unable to do any manual labor. He died from a severe cold that he contracted while in the line of duty. It settled into his lungs. Summary of statement of B.B. Blake, 5 February 1906: He was 60 years of age, a resident of Green Pond, Colleton County, SC. He knew the late Dr. H.E. Bissell having lived with him for years. He went around with him to see his sick patients and, by doing so, learned to get certain herbs for colds, etc. He was, at the time of his statement, selling herb medicine and had been for 35 years. He knew March Chisolm when he entered the service and when he mustered out. He gave March medicine for a cold until March died, about six months after coming home from the war. March complained of pain in his side and a cough. He could not do anything much to make a living. B.B. Blake gave the medicine for the lungs to March for 50 and 25 cents per bottle. B.B Blake lived on the same place as March Chisolm. March died from a cold and pain in his side. 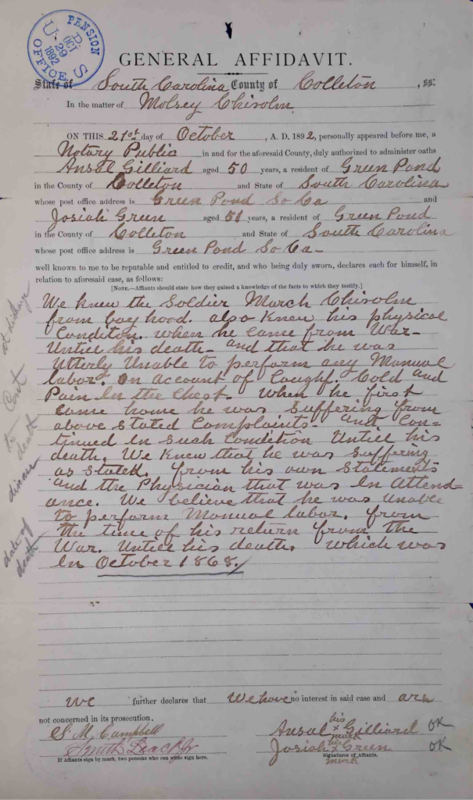 Summary of statement of Jackson Grant, 19 March 1906: He was 73 years old, a resident of Long Brow, Colleton County, SC. He knew March Chisolm before the war started and positively knew he did contract a cold before he was mustered out. He did not get well from the cold and had it until he died in October 1868. He entered the U.S. Army a healthy man. He was very nervous at time, especially the last year they were in the service. He had pains in his back and side. Even so, he was faithful to his duty. Jackson was by his side and in the same tent all the time with him. 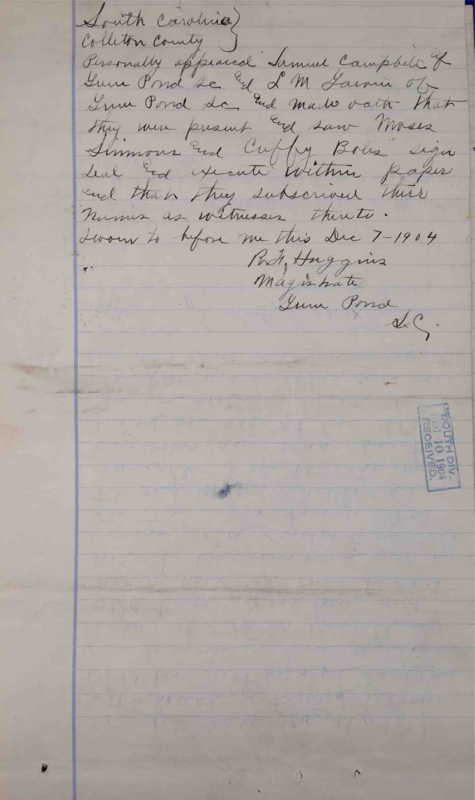 Summary of statement of Samuel Campbell, 19 March 1906: In 1892 he was at Green Pond, SC and saw (late) Dr. H.E. Bissell give Molcy Chisolm a written testimony concerning the death of her father, March Chisolm. 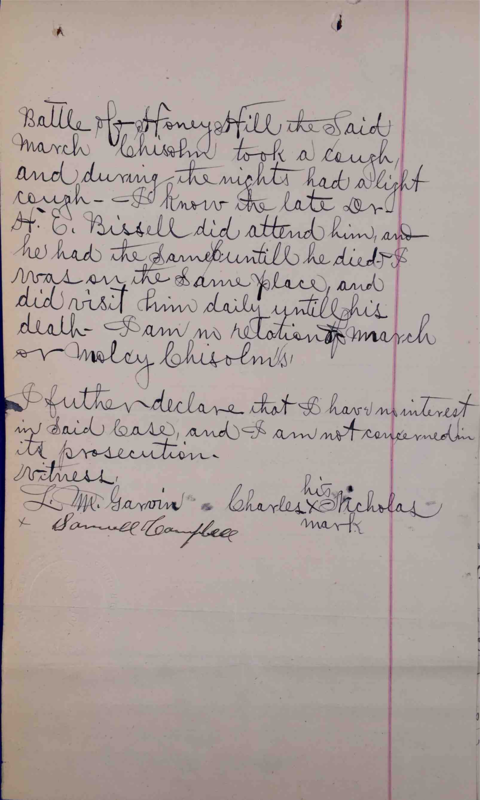 He heard Dr. Bissell say that March Chisolm lived on his place and that he had given him medicine while he was sick. Samuel Campbell was 50 years old at the time of his deposition. Summary of letter to the Commissioner of Pensions, 9 April 1906: Letter from Mingo Vandross, Will Middleton, and Cuffey Bolls stated that they knew him to be a hardy man when he entered the army. They were in the same regiment and company as March Chisolm and mustered out when he did. About the first of 1865, March told them he felt a slight pain in his back and loins but he never complained. He was a brave soldier and would follow command until he fell dead before he would have given up. After getting home he was better for a year but still complained of slight pain in the back and loins. He finally got so bad he went to Dr. H.E. Bissell for treatment and from him to Dr. Simon C. Grant about the first of 1868. At that time he was suffering very much from congestion and/or scarlet fever, general weakness and poor appetite, sleeplessness, and kidney pain. He suffered from these things until he died. They buried March Chisolm with their hands and they knew he died from a severe cold that he contracted in the army. He left one child, Molcey Chisolm who was 8 years old, when he died. 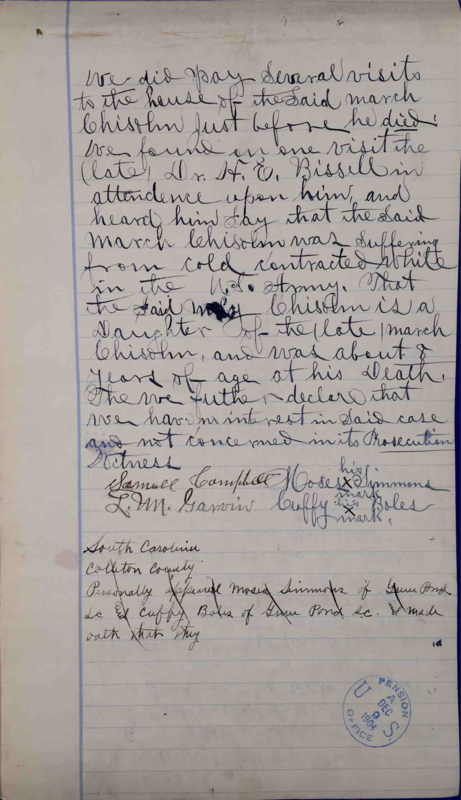 Summary of statement from Dr. Simon G. Grant, 29 August 1906: March Chisolm went under his care in 1 January 1868. He was suffering with pain in the chest and back, and pain in his left side. He was unable to rest and was sick with a severe cold that settled in his lungs. He also had consumption and heart failure. He died 10 October 1868. He believed March Chisolm died from illness contracted while he was in the service. Summary of letter to the Commissioner of Pensions, 20 December 1906: The letter was from Molcey Chisolm, daughter of March Chisolm. She was living at White Hall, SC. She stated that Jack Grant and Cuffey Bolls were all working their claims at the same time in Green Pond, SC. She said that a man named Henry Chatman was the claims manager and he forwarded the claims to Walterboro, SC. Mr. C.G. Henderson was master of the Court and he worked on Molcey’s claim in Walterboro and then sent it to Washington, D.C. Her claim number was 6841. 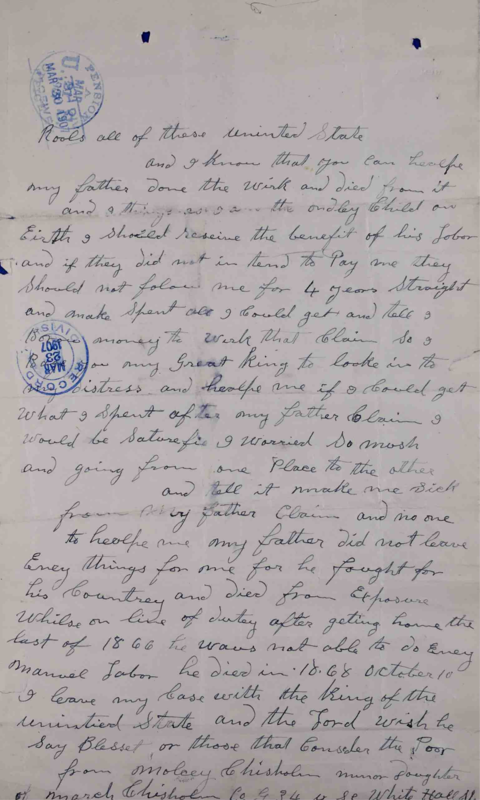 Summary of letter to the Commissioner of Pensions, 20 October 1908: The letter from Molcey Chisolm, daughter of March Chisolm, stated he was never able to work after coming home from the war. She was eight when he died. She stated she lost all that she had at Green Pond, SC because she mortgaged all of her property to raise money to pursue the pension claim and was, at the time of her letter, staying at Youngs Island, SC. 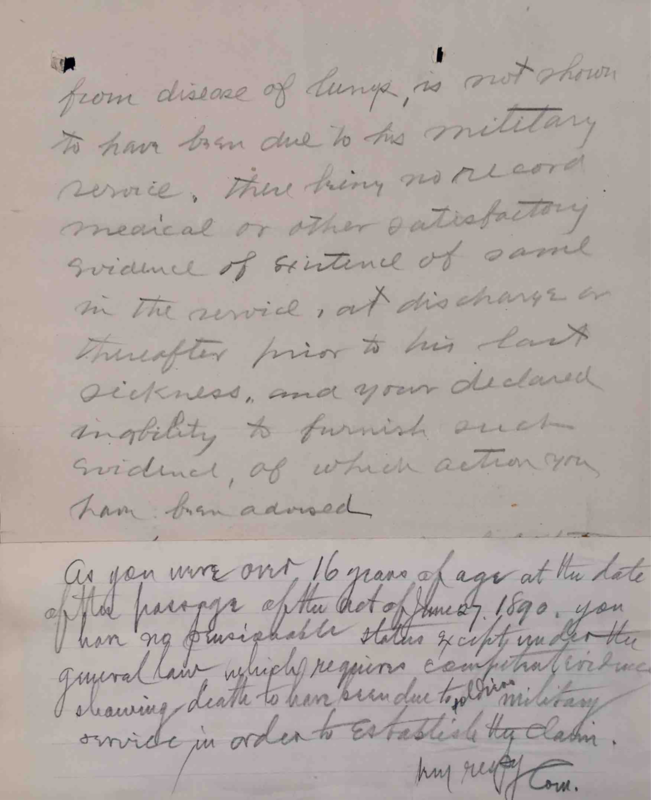 Summary of statement of Will Middleton, 6 November 190[not completed]: He stayed on the same place as March Chisolm and was at his bedside when he died. He suffered from pain in the side, pain in the chest, and he coughed night and day until he died.